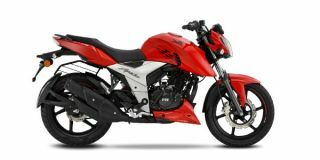 TVS Apache RTR 160 4V price in Delhi starts from Rs. 83,145 (Ex-showroom). Apache RTR 160 4V is available in only 6 variant. TVS Apache RTR 160 4V Carburetor Dual Disc is priced at Rs. 86,145 and the top-end variant TVS Apache RTR 160 4V Fi ABS is priced at Rs. 98,785. TVS Apache RTR 160 4V's top competitors are Bajaj Pulsar 150 (price starting at Rs. 64,998 in Delhi) and TVS Apache RTR 160 (price starting at Rs. 78,338 in Delhi).